The Dusty 45s have inspired and fired up crowds for over two decades. With a dynamic sound and signature style, they champion the foundations of American music to the delight of fans and critics alike. Ripping through their original hits while paying homage to the likes of Buddy Holly, Herb Alpert, Johnny Cash and Louis Armstrong, the band brings audiences to their feet and leaves them begging for more. Their finished product is a sizzling sound uniquely their own. Creme Tangerine is a dynamic five piece band from Seattle that performs the music of The Beatles for thousands each year. Rather than focusing on the personalities or look of The Beatles, Creme Tangerine performs their beloved music live for all to enjoy. Their performances on large and small stages have included The Beatle’s most recognized hits as well as different eras of the Beatles music and “The White Album” , “Abbey Road” , “Sgt Pepper’s Lonely Hearts Club Band”, and the “Rooftop Concert” in their entireties. Their high energy, quality performances appeal to those already familiar with and new to the music of The Beatles. Crème Tangerine is able to tailor a performance to meet event objectives. As such the band can perform rock/pop hits spanning the entire rock and roll era. Tres Leches is Alaia D’Alessandro and Ulises and Zander Yates. Together the trio find expression for life’s chaos and an escape from societal pre-destiny. Following its release their EP promptly shot to KEXP’s #3 on the Northwest Music Charts. Critics have compared it to Elastica, Parquet Courts, CSS, Thee Oh Sees, The B-52's, Savages and The Runaways. Known for their high energy show, Nite Wave continues their '80s dance ways performing New Wave hits from Duran Duran, INXS, Frankie Goes to Hollywood, The Cure, New Order, Prince, Depeche Mode and more! Most noted for being handpicked by Billy Idol to open for the legendary '80s rocker, they have also performed with Multi-Platinum recording artist Tiffany and Everclear. Featured on CNN and Good Morning America, Nite Wave has help raise over $17,000 for Northwest Harvest and American Red Cross. Seattle’s Radio Raheem formed in 2011 out of the ashes of several local bands, and not by chance. Founding members, bass player/producer, Paul Chistofferson, and guitar player, Bryan Cohen were set on having some fun. The two began writing 80’s influenced upbeat rock and new wave songs that would inspire requisite dancing and general happiness. Strong Suit has been called a Seattle super group, which might sound strange considering you may not have heard of some of the musicians in the band. But if you’ve seen much live music in Seattle, you’ve probably seen these guys play. Strong Suit is made up of the some of the most in demand, most respected sidemen in town, each getting the chance in this project to play to their strength- their Strong Suit- free from the restrictions of someone else’s name on the marquee. These guys are some of the busiest working players in Seattle, which means the band doesn’t get to play together very often. 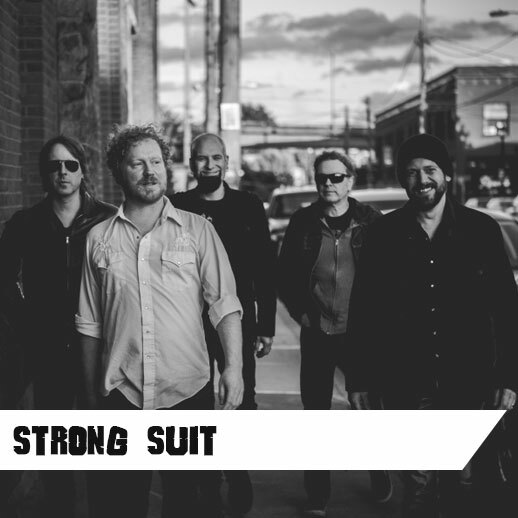 Don't miss your next chance to see STRONG SUIT! Hailing from Northern California's Sacramento, Soft Science fuse melody, and texture inspired by 60s pop and 90s shoegaze to create their own sweet blend of modern pop music with a sonic edge. In 2011, Soft Science debuted with their first album ‘High and Lows’ , with Pop Matters noting the band’s “potential to become one of the great Left Coast power pop bands.”The dream-pop syndicate are currently playing live in support of their new album 'Maps' LP and will be performing at the Paris Popfest this September. A goody bag of BLUES, PUNK and BLACK POWER! - Simply put...The Black Tones are like a mixture of Kurt Cobain and cornbread. Consisting of founders/twin siblings Eva Walker on guitar/vocals, Cedric Walker on drums, and Robbie Little on the bass. Black Nite Crash is reverb-drenched fuzz pop, a mix of atmosphere and energy, focusing on themes that haunt dreams... girls, gods, and altered states. Strong songcraft and dark moods meet with nods to Sixties Psych, Post-Punk, Shoegaze, and Brit Pop. Melody, Noise and the Beat. Yeah. The Close Seconds play clean, unvarnished rock songs of regret and redemption. Two bright guitars ringing over locked-in rhythms. The four members--Alan Wenokur on vocals and guitar, Eric Stovall on guitar, Steve Reeves on bass, and Dan Thornton on drums--combine years of playing and listening experience, grounded in the purity of rock. Anchored by Alan's original songs, The Close Seconds' sound is undeniably distinctive, but contains echoes of artists like Big Star, Wilco, and Neil Young. The band has been busy in the studio working on their first record, and is truly excited to be playing the Kirkland Summerfest. Kirkland’s own original ukulele rock band are in the house! Known for their motto “wine drinkers with a ukulele problem”, Marilyn & the G Strings will get you “boogieing your sneakers away” with their eclectic repertoire of old and new tunes you’ve never heard performed on ukuleles before. Guitarist, songwriter, singer. Former lead guitarist with Shadow, Goodness and The Rockfords. Writing songs is my favorite thing. I try and do it every morning and get just a little beginning of an idea to coax. Usually it involves a bit of time, some sitting, some changes and changing again, but then you get there -- the heart of it. The center of the circle, and all the other layers, harmonies, and even the words are complimentary. 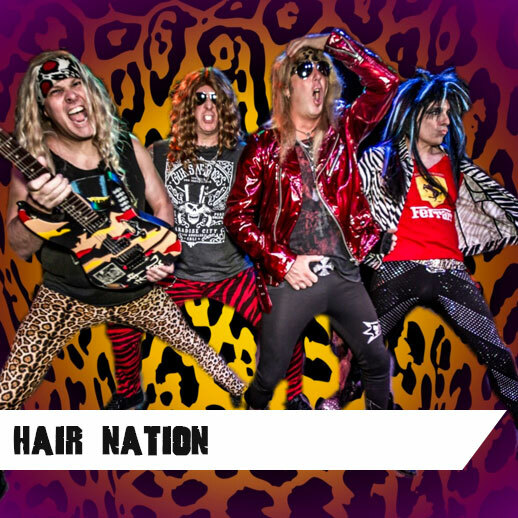 Hair Nation, the region's Ultimate 80's Hair Rock Band, recreates the experience of the mid-80's hair rock scene: powerful, high energy shows that dazzle crowds, with authentic 80’s era outfits, humorous banter and rad stage show. Experience the sounds and antics of Bon Jovi, Van Halen, Def Leppard, Motley Crue, AC/DC, Twisted Sister, Whitesnake, Gun N’ Roses, and more! Reviving music from an era when the men looked like women and the women looked like even hotter women, Hair Nation is THE band that really gets a crowd up and rocking, dancing and singing along...great fun had by all! 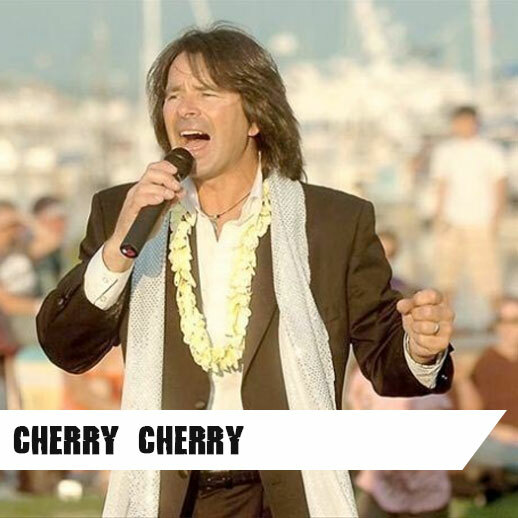 Cherry Cherry is the Premier Neil Diamond Tribute! Neil Diamond’s music is timeless and ageless. His classic songs evoke memories that every crowd will enjoy. One of the coolest variations of the Neil Diamond experience we've ever seen, all the hits, horns and hoopla makes the "Cherry Cherry" show rock! Full on menu of Neil Diamond's repertoire spanning his entire career this tribute proclaims, "GOT NEIL" yep!